Fits perfectly in my seat mounted water bottle holder and carries a tube, tool, and co2 pump no problem. This works great to put small things in. If you want to get s drink and use can use this for a liquid also. Top is flimsy and flies off. I keep my inflator, 2 CO2 cartridges, tire levers, multi-tool, and patch kit inside. Added a rag to hold it all together and keep it from rattling. The only issues I have are that my inflator won't fit with a cartridge in it (check your's first), and the top is only held on with 1-2 threads, which seem like they are going to pop if you try to max out the capacity. With that said, it hasn't come off yet, and there's plenty of room for 2 cartridges even without storing one in the inflator. Hold more then a small saddle bag. Large lid makes it easier to pack crap. Seem water proof, Secure in bottle cage. Just wish the container walls wasn't so thin. Sometime the lid will pop off from squeezing the container when removing from a tight bottle cage. I actually am very happy with this little carrier. I've used it for Gels, Cliff Bars, Wallet, Watch, Trash, etc.... I don't use the lid since I'm in and out of this thing constantly on my ride. It doesn't rattle and fits nice and snug in the bottle carrier. For $3... its not a bad purchase. It does what it supposed to do. I use it to carry a lightweight rain jacket. I used to just cut the top off a water bottle. Now I have the same convenience but with a cover. Holds more than a saddle bag. Holds ID, credit card, spare change, spare tube, Co2 Cartridge and inflator, levers and a patch kit and a passport for those cross border rides(and it keeps it dry). On days when you need only one water bottle, putting your co2 cartridge, inner tube, and tire levers in this half bottle with flat lid and keeping it in one of your bottle cages surely beats having all those items form a super big bulge in your jersey pocket. No need anymore for cutting up two old bottles and making one of these yourself as many cyclists do. This is perfect and inexpensive. great alternative to bulky (and sometimes ugly) saddle bags.Sometimes I just use it to carry keysfood etc. if my jersey doesn't have pockets or if they're filled with wind jacket etc. 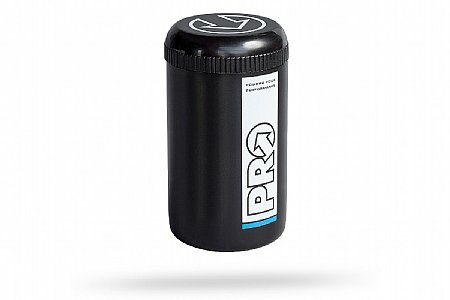 I bought the PRO storage bottle 'cause I hate having the typical seat bag rubbing on my thighs or otherwise looking quite un-pro back there. I'd been using a chopped off water bottle to hold my spare tubular, CO2 cartridge and mini inflator. The PRO storage bottle holds all this and the screw on lid protects it from the elements. And much cooler than a seat bag!! I thought this seemed like a great idea & purchased one. I went riding and the top flew off & I ended up loosing both my CO2 inflator & a cartridge. More secure to stash your accessories in a zippered zip lock. excellent utility. will fit cell phone or extra tube, etc. fits better in bottle cage than the product I used previously. would like to be able to get one in the length of a 20 oz bottle for extra storage for longer rides to the middle of nowhere. Good quality & reasonable px. It is great if u have another option in 750ml. It fits perfect in a bottle holder, holds a lot of stuff and is easy to use. I put a energy bar or two, some tools, and whatever I need. I love it!